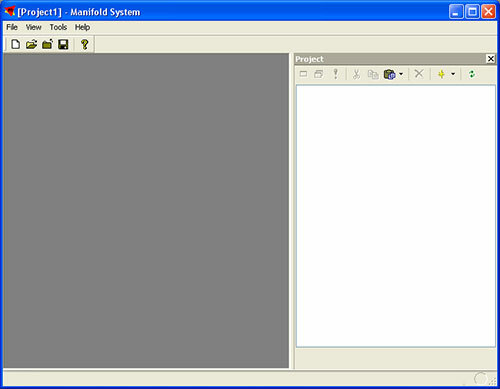 The project tab on the right is somewhat like the “Solution Explorer” in Visual Studio, but a little different. You cannot drag and drop files onto project area which to me was quite restricting. I would have loved to just grab a ton of shapefiles and drop them right there, but you have to use a different method to add a shapefile. 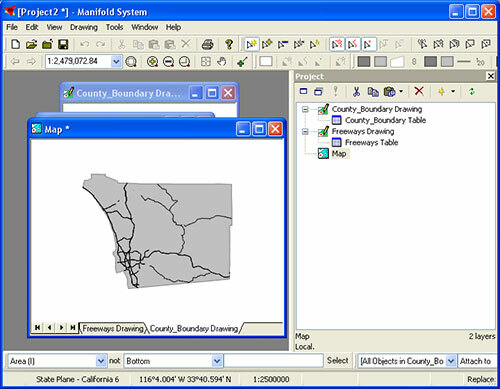 Manifold calls these datalayers “Drawings”. I won’t get too much into what you can do with drawings as the help does a pretty good job of that, but think of each drawing as a dataset. If you have 20 GIS layers in your project, you’d have at least that many drawings and images (images are rasters in Manifold). 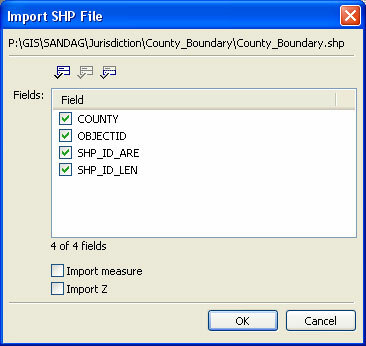 Because you can’t drag and drop datasets into Manifold, you have to use the import function. In this case you see that I choose to import a drawing, but you have other choices too. 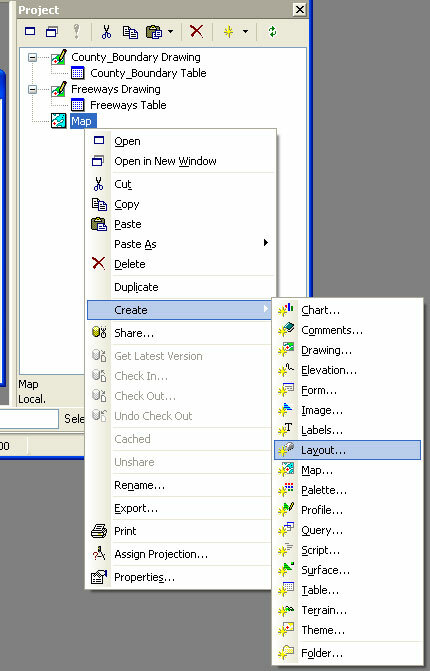 Now you browse to where you shapefile is located and choose the type of file below. I found this very counter intuitive as I would have though the default would be all possible drawing files rather than having to choose just one. Microsoft Office has an “all files” option and I would have though Manifold would too. So to see shapefiles, you have to choose the type below. One other thing that annoyed me about this import was that it kept dropping me back into My Documents. If all your files are in one directory this isn’t a problem, but after I add a shapefile I have to go back to the import and start all over again. 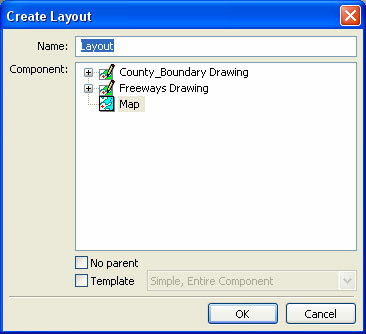 When you find the shapefile you want, you get some options to specify and then it you have your drawing. 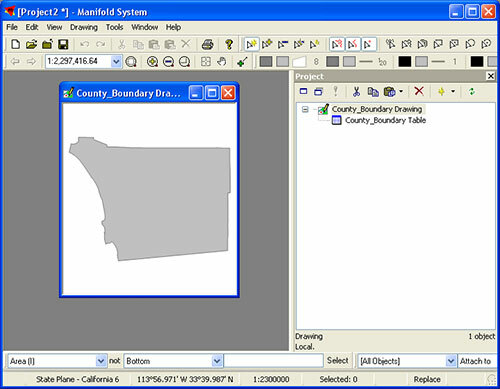 You’ll see below how the drawing looks after the shapefile was imported. 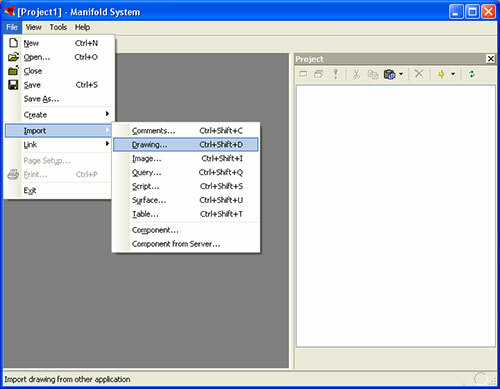 The toolbars give you access to the colors and other symbology that you might want to set. Repeat these steps for every dataset you want to bring into Manifold. Now if you want to make a map with these drawings, you create a new map in the project. You then choose the drawings (or other types) that you want to see in this map, pretty straightforward. 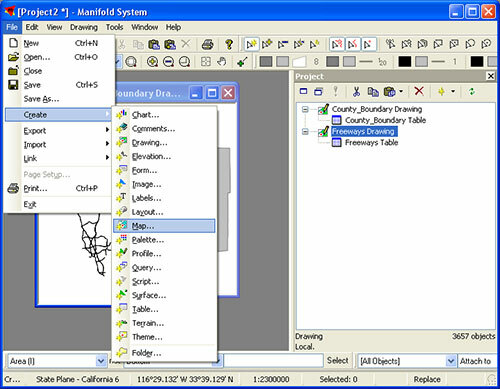 Finally you see your new map showing all the drawing files you selected. 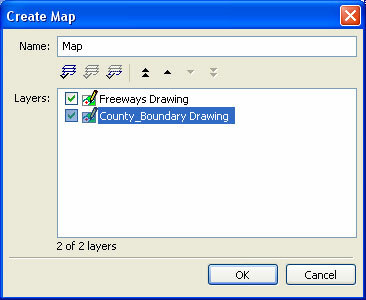 Again you make changes to the map by using the toolbars. One thing what was a little counterintuitive was changing the order of the drawings. Those tabs at the bottom can be moved around like the worksheets in Excel. The one to the left is on the “top” and the one on the right is on the “bottom”. Logically I’d say that this should be vertical as every drawing program I know does it this way. Again you get to set some options. And then you get the layout view. 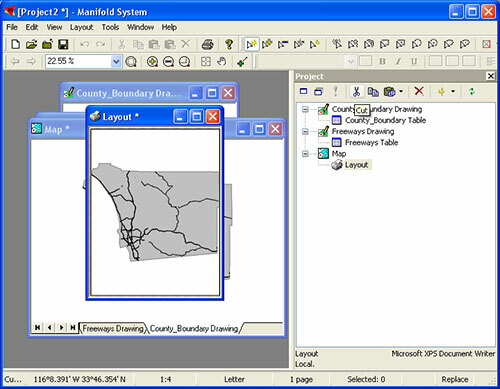 The toolbar gives you the option of scalebars, north arrows, graphic lines, text, etc. Then all you have to do is right click and print. Now I’ll be honest, this have been very difficult for me coming from an Autocad/Arcinfo background. Things are intuitive to me at all. But to be fair, neither was ArcView 2 when it first arrived. With work I’m sure this would all become second nature, but to me I felt like banging my head though my desk. I don’t really care too much about creating printable maps in Manifold as that isn’t what is interesting me. I’m going to start delving deeper into some of the analysis and KML export tools to see what one can do with this product.